RRB Secunderabad Group D Admit Card/ Exam Dates Hall Tickets CEN.02/2018. RRB Secunderabad Group D Exam Dates, Hall Tickets 2018 Available Here. The Railway Recruitment Board Secunderabad has invites online applications from eligible candidates for filling up group d posts i.e, Trackman, Gateman, Pointsman, Helpers in Electrical/ Engineering/ Mechanical/ Signal posts. All over India, the total number of vacancies are 62,902. Total number of posts in the RRB Secunderabad Region is 6,523. Applied candidates can download the RRB Secunderabad Group D Exam Hall Tickets/ Admit Cards through RRB Secunderabad official website at rrbsecunderabad.nic.in/. You can also download through https:// secunderabad.rrbonlinereg.in. We have provided, the procedure on how to download the RRB Secunderabad Group D Admit Card of CEN No. 02/2018. Follow the below steps and then download your admit card. The RRB Group D exam admit cards are issued in the alphabetical wise. So, Before downloading the exam hall ticket, candidates can check your first letter of your name, surname (which is enter in the application form) and download the admit card. Recently, RRB has released the exam dates and admit card downloading dates for Group D. The admit cards/ call letters are available one week/ 10 days prior to the examination dates. The Online examination is going to be start on Septamber 17, 2018. The exam date, city and shift details will be given by rrb secunderabad. Now you can click on the below link and enter your registration number and date of birth, then click on the submit button. Aspirants can download the RRB Secunderabad Group D exam admit cards in alphabetical order wise. If, the official dates are announced we will intimate you. So, keep our website at rrbsecunderabad.in, for further information. Note: The RRB Group D Admit Card will shown 4 days prior to the examination date. 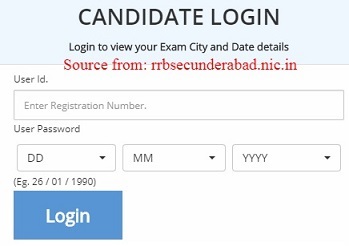 So, all the candidates can login in to the above link 4 days before to the date of exam. For more details, you see the above official link. Please send me the download link of GROUP D admit card / hall tickets. To know your exam date and city, please login into below link. I attempt 84 question in rrb secundrabad group d in handicaped category 945828…. I am Sreeram Prasad, I did group d exam, I don’t see exam results & I checked Cutt off’marks. Today see , but not open that site. Please date exemption & I received, reply to you.please sir.